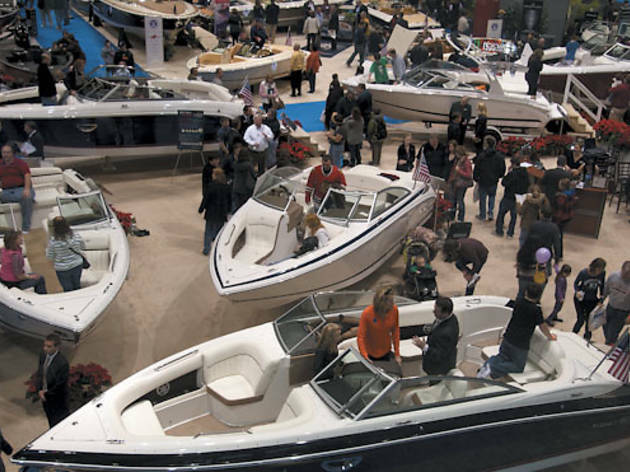 The 83rd annual Chicago Boat, Sports & RV Show comes to McCormick Place. It’s kind of random to have a boat show in the middle of January. Chicago Boat, Sports and RV Show manager Keith Ogulnick knows this. “That’s always our most popular question,” he says with a laugh during a recent phone interview. But Ogulnick figures the Midwest’s largest ode to all things nautical is an essential coping mechanism for the gruelling Chicago winter. “After the holiday, people slip into the winter doldrums. [The boat show] gets people thinking about warmer days ahead. It gets people excited about the outdoors and provides a bridge to spring,” Ogulnick says. It’s also a way to get good deals on boats during the off-season. Marine manufacturer and dealer Hubbard Erickson Sr. put on the first boat show at Navy Pier in 1930. In the ’40s and ’50s, the boat show was an extravagant affair. “Most shows were two weekends long,” explains Ben Wold, the executive vice president of the boat show’s umbrella organization, National Marine Manufacturers Association. “There were lots of big engine displays, a lot of big name stage entertainment,” entertainment like pork sausage purveyor Jimmy Dean, who was also a successful country music singer in the ’40s and ’50s. The ’80s were the show’s golden years, though. An estimated 100,000 people attended the shows. “There were 100 travel exhibits, a full floor of RVs, 700 boats and 300 RVs,” says Wold. The bad economy has made the boat show a humbler event in recent years, but there is still a lot to do during the five-day show. Six hundred boats and approximately 100 RVs will be on display, but the show’s main appeal is as a compendium of an insane number of activities geared toward families. There’s a virtual Boating Lifestyle exhibit that simulates a real lighthouse and harbor. There are demos on paddle sports and tutorials on basic boating. Professional weird person Joey Green, whose claim to fame is getting Barbara Walters to put a diaper on her head and persuading Jay Leno to shave with peanut butter, will be giving demonstrations on the nuttier things you can do in the great outdoors—like starting campfires with Doritos. You can go fishing and scuba diving or just admire some old, wooden Gage-Hacker boats. There’s also an opportunity to get up close with one of the world’s fastest racing boats, Miss GEICO, a 10,000-pound juggernaut. “The best part about this show is that it promotes the outdoors,” Ogulnick says. Even in the bleak midwinter. 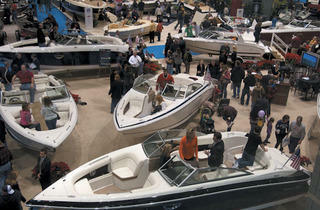 Chicago Boat, Sports & RV Show, McCormick Place, 2301 S Lake Shore Dr (312-946-6200). Wed 9, 2–9pm; Thu 10, Fri 11, 11am–9pm; Sat 12, 10am–9pm; Sun 13 10am–5pm; $12, kids 15 and under free.